Here's the video game artbook for Akaneiro: Demon Hunters. That's a RPG hack and slash game developed by American McGee's company Spicy Horse that you might remember who are also the creators of Alice: Madness Returns. 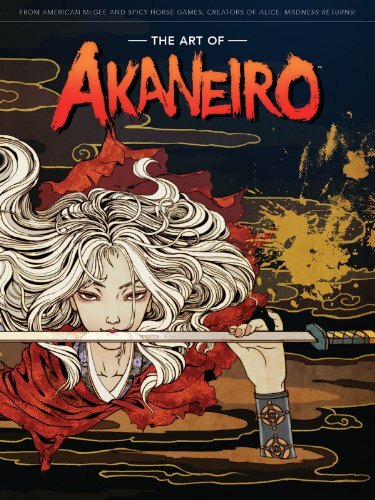 Akaneiro is actually a game funded successfully by Kickstarter back in Feb 2013. The artbook is hardcover, 96 pages. The featured concept art are for the characters and location. The style of art is reminiscence of Chinese or Japanese paintings with the use of black, ink washes and brush strokes. It gives the designs a very traditional look to them. The art is almost like a cross between that of Okami and Alice: Madness Returns. Since the setting is based in feudal Japan, the character designs have costumes that are inspired from that era. There are lots of interesting modifications and variety. Main character is Little Red Riding Hood while the other characters have less coverage. Monster designs are pretty nice. There are animals clad in Japanese armour, spirits and demons, walking skeletons, walking trees with feet that look like insects, etc. Environment art are more like mood paintings, more expressive than detailed. There are also some props, like houses, food items. Weapon designs are included. Each weapon has 10 levels, with the low levels weapons looking like they are handmade. With upgrades, they evolve level by level into the powerful and strong-looking weapons. It's cool to see how the weapons evolve. The last few pages are storyboards that give snippets of main story points in the game. They are drawn black and white in comic style. And finally there's a brief gallery with three double page illustrations of the game in heavy Japanese-folklore inspired art. Those look good. I wish there could be more pages. Nice artbook for fans of the game.